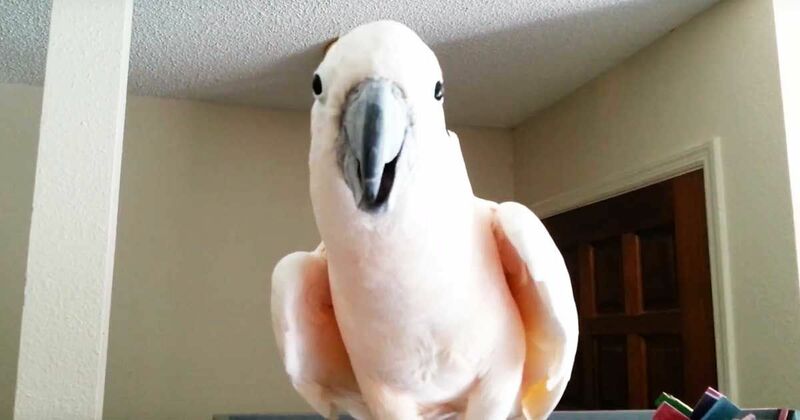 A hilariously lovable cockatoo has just learned his own catchphrase – and it's so cute, he's taking the internet by storm. In the YouTube video, Lolo the Moluccan cockatoo is seen bouncing around and imitating his caretaker. Lolo, who is a beautiful pale pink, opens his mouth and lets out a loud, "Whaaaaat's uuuuupp." The cockatoo speaks so clearly, his caretaker laughs out loud at his human-like expression. Lolo is actually a rescue, living at the Exotic Avian Sanctuary in Tennessee. While these animals can be quite funny, and admirably smart, it's these very characteristics that some owners just can't handle. The sanctuary's Kim Hannah, who posted the video, reminds people looking to bring one of these amazing birds into their homes to always look to adopt first. And we have to say, Lolo and his catchphrase make a great case for adoption! But, don't waste any more time: Check out the hilarious video below. Lolo is just too cute, right? Share this hilarious video now with your friends on Facebook, Twitter and Pinterest.